Günther’s sea snake, a rarely seen venomous sea snake with distribution thought to stretch from the Malay Peninsula to Pakistan, has now been recorded from Iranian coastal waters off the western Gulf of Oman. Scientists Mohsen Rezaie-Atagholipour, Qeshm Environmental Management Office, Qeshm Island, Iran, Parviz Ghezellou, Medicinal Plants and Drugs Research Institute, Shahid Beheshti University, Iran, Dr. Nicolas Vidal, Département Systématique & Evolution, Muséum national d’Histoire naturelle, France, and three Iranian fellows, are collaborating on a project on the biodiversity of sea snakes in the Persian Gulf and Gulf of Oman, Phys.org news website reported on Monday. In 1864, German-born British zoologist, Albert Günther (1830-1914), discovered a new species of highly venomous viviparous (giving live birth) sea snakes, thereafter named Günther’s sea snake (Microcephalophis cantoris). The species is famous because it has a very small head, compared to its body and is, therefore, sometimes called Günther’s narrow/small-headed sea snake. It is a rare species, and, since its discovery, it has only been recorded from the coastal waters of a few countries in the western Malay Peninsula and the Indian subcontinent. 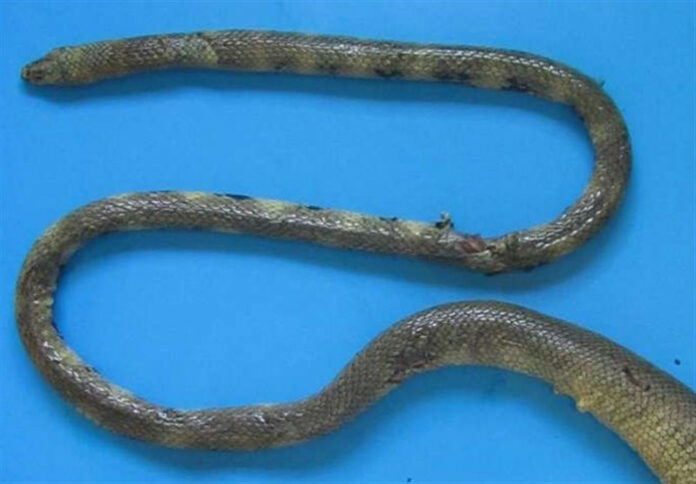 During their survey, an adult Günther’s sea snake was caught by a fishing trawler (a fishing vessel pulling a baglike net) in Iranian coastal waters off the western Gulf of Oman. This was the first record of this rarely seen venomous viviparous sea snake in the area. The specimen is deposited and available in the Zoological Museum at the Shahid Bahonar University of Kerman, Iran. As a result, the researchers have now published a checklist of the sea snake species in the Persian Gulf and Gulf of Oman, including this new record, in the open access journal ZooKeys. There are about 60 living species of highly venomous viviparous sea snakes in the world, distributed throughout the tropical and subtropical coastal waters of the Indo-Pacific region. Out of them, nine have been previously recorded from the Persian Gulf and the Gulf of Oman. Following the discovery of the Günther’s sea snake, the total number of sea snakes in the area is ten.